The ability to develop meaningful customer relationships depends heavily on trust. Do consumers trust your brand enough to make — and repeat — a purchase? Do they trust that your product or service will deliver the kind of value that’s worth its price? Do they trust your company to help solve their problems and respond to their needs? Two sectors in which trust is a particularly crucial factor are financial services and insurance. Unlike, say, in the restaurant industry, where the consumer’s decision to trust is the decision to pay the cost of a meal, the risks, costs, and stakes involved in finance and insurance are obviously weightier. We’re talking about a person’s savings, financial investments, home and mortgage, retirement plan, health and well-being. 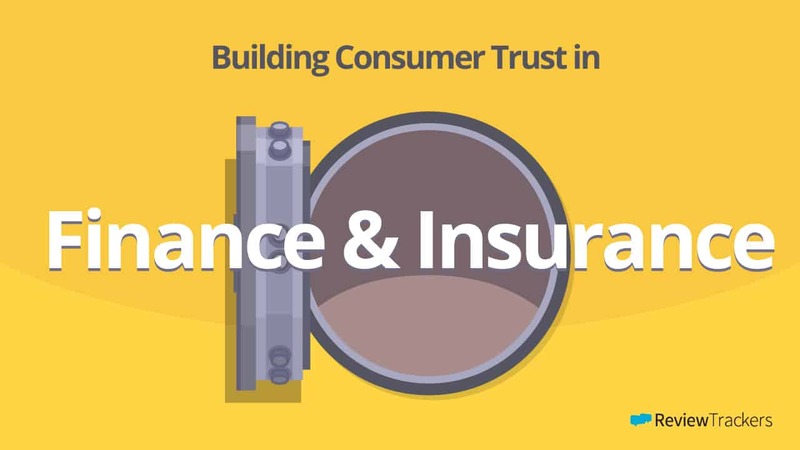 However, finance and insurance — two industries that are predicated on consumer trust in order to function — are often perceived as lagging in that department. According to an IBM survey, only 43 percent of consumers trust the insurance industry. In fact, the lack of trust in insurance providers has remained above 50 percent since 2007. Indeed, in finance and insurance, trust is a powerful business currency. According to a report by Concerto Marketing Group and Research Now, 83 percent of customers would recommend a company or provider they trusted to others. But how do you get to the point where your brand is able to inspire trust among potential and existing customers? Solutions vary, but the key lies in a type of resource that your business may already have, but which you might not yet have been using to your full advantage: customer feedback. Consumers today rely heavily on online reviews — not only to choose where to have lunch or which hotel to check into, but also to make bigger decisions, like where to get healthcare, or who has the best auto service coverage, or which banks or insurance providers are trustworthy. According to a 2014 ReviewTrackers survey, 68 percent are unlikely to decide on an insurance agent with zero reviews. When choosing where to open a checking account, 63 percent of Millennials and 54 percent of Boomers cite personal experience, reviews or recommendations as being the most influential factors. These figures show why it’s so important that you manage your online reviews and customer feedback on channels where people are talking about your brand. Whether it’s in the form of a Yelp review, an aggregate star rating on Credit Karma or Lending Tree, or a candid comment on Facebook or Google, customer feedback is an important trust factor that plays a crucial role in shaping consumption behavior. By staying on top of online reviews, and by listening and responding to feedback, you can more effectively develop and sustain trust-based relationships with your customers and policyholders. Claim your business listings on all relevant feedback channels, including online review sites, social media platforms, and local business search apps and services. Monitor reviews, ratings, and feedback to gain a better, more detailed understanding of the customer experience. Respond to online reviews, both good and bad, to drive communication and engagement levels, strengthen brand reputation, and foster trust. Sure, it’s nice to have corporate social responsibility (CSR) programs, green supply chains, charity campaigns, and similar initiatives that you’ll find in your PR firm’s strategic brief. But another effective way to demonstrate business integrity is simply to leverage customer feedback. Say thank you. Customers are more likely to engage if you make them feel that your business is listening. Show that you value their feedback and thank them for taking the time to share it. Empower the voice of the customer. Encourage online reviews, conduct surveys, and urge your customers to share and be more vocal about their experiences. Prove that you care about what they think. Invest in tools and technologies that capture customer feedback. Not only does this help you generate fresh, relevant content; it also harnesses the tremendous potential of having happy customers whose trust you have already earned. From static sources of revenue, they can become brand advocates who won’t hesitate to make recommendations and drive referrals for your business. Of course, you won’t always get five-star ratings and gushing praise — no company ever does — but that’s not the point. What’s important is your ability to show that yours is the kind of business that embraces, instead of fears, information provided directly by your customers. Don’t remove or censor the negative. A natural reaction to receiving a bad review or a one-star rating is attempting to have it removed. But don’t. Integrity doesn’t require perfection. It does, however, involve the willingness to accept where you might have fallen short of expectations as well as to identify specific areas you can improve on. Besides, customers aren’t stupid: if a financial services provider or insurance company seems too good to be true, 95 percent will suspect censorship or a faked reputation. It’s not enough that you have a great mix of products and services. You must deliver consistently excellent customer experiences, too. Banking customers and policyholders might be impressed with your digital strengths, rewards program, or coverage options, but this doesn’t necessarily equate to trusting you. Grow your customer relationships beyond providing transactional convenience and focus instead on the customer experience. Make next-level service and support an investment priority. Reengineer your sales and marketing strategies based on customer feedback. And tailor your communications in ways that offer customers a better understanding of how your products and services can meet their goals and expectations. The financial services and insurance industries will always have a unique set of challenges and opportunities — not least in the area of consumer trust. By leveraging customer feedback, you can gain a competitive advantage and develop meaningful customer relationships that improve your bottom line.